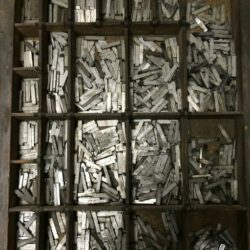 Letterpress Printing: Past, Present, Future is an AHRC-funded Research Network that is exploring the survival of historical printing equipment and how it is used today. The network brings together scholars, museum professionals, printers, and other interested people to explore the legacy of historical presses and type – what survives and where; its condition; as well as what it has to teach us, both about the textual and typographical cultures of the past, as well as those of today. While there has been a resurgence of interest in printing with letterpress, prompted in part by the dominance of digital methods, the skills required to use and interpret such equipment are unevenly distributed and difficult to acquire. This project provides the opportunity to pool expertise and take stock, putting into place plans to safeguard the survival of equipment and the means to use it.